My head has gotten bigger. 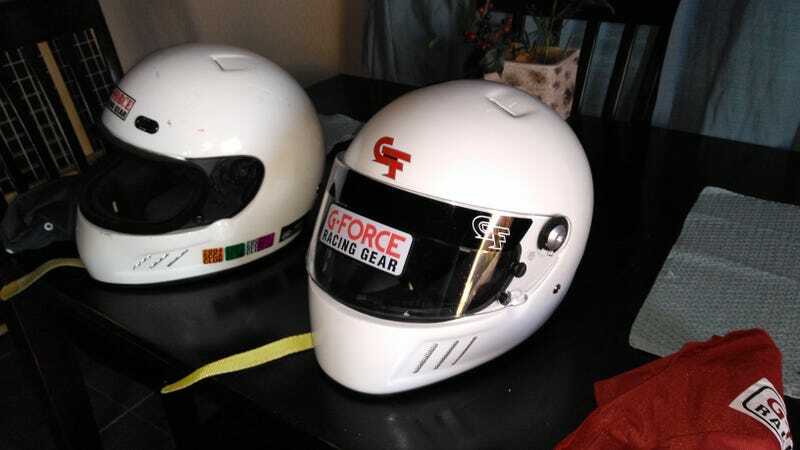 My birthday present has finally arrived in the form of a new helmet, which is also needed to play with the racecar again next year. My old helmet with an SA 2000 rating is too old to play with. The new one even fits me now being a size larger, because apparently my head has gotten bigger since I was 17. As a bonus, the bag is the right color to support the red and white color scheme of the racecar. Comparing the 2017 GF3 to the 2002 version of the same helmet, they’ve most notably improved the visor seal with a rubber gasket replacing the old felt one (although I usually remove the visor from my helmets). They’ve also gotten fancier with thier label and how the venting goes through the inner shell. Now I’m only a head and neck restraint, new seat cover and some fresh vinyl away from an annual tech. Also, this tag made the former autocrosser in me smile.